In this podcast I conduct a live Q&A and take a variety of questions ranging from how much muscle and fat you should gain on a bulk to weighing food before or after cooking to drinking calories and more! 00:13 – What LBM (lean body mass) to fat ratio can you expect to gain while bulking? 05:14 – Is it bad/dangerous for my health to steal from my fats to add to carbs, leaving me getting around 10-15% of my daily calories from fat? 09:44 – When is Phoenix coming back in stock? 15:33 – I’m not progressing on my squats as fast as the rest of my body. Can I add squats to Day 1 and Day 3 on BLS? Or is that too much volume? 19:28 – Whenever I try to work my chest, I only really feel it in my “front” delts area. How come? How can I fix it? 22:56 – Can you talk a little bit about your fiction writing? 31:05 – Thoughts on CLA supplements? 31:34 – How is your Stacked App tracking? 33:39 – You recommend liquid calories like fruit juice for hard gainers. Is all that fructose a problem? Does it matter where your sugars/carbs come from? 36:07 – If you’ve been lifting for a while, but you’re still weak with an average body fat percentage, is recomping still possible? 37:48 – Do you ever play with your potassium vs sodium levels between cuts, maintenance and bulk? 40:02 – What happened to the forums on Muslce for Life? I miss the community! 41:46 – A while ago you mentioned potentially investing in European warehouses to house Legion stock for the European customers. Is this still an option you are considering? experiences? Anything you wish you would have done differently? 46:55 – Suggestions for weight progression? I’m female, been lifting for about 6 months and seem to have stalled on adding weight to my big lifts. 48:44 – Any update on the new grass-fed whey protein from Legion that you’re working on? 51:43 – For tracking calories, do you weight meat before or after cooking? 53:09 – I’m at 8% body fat (using your 1 point method-video) and still have a considerable amount of fat around the bellybutton. Is this just really stubborn fat? 54:19 – You recommend Vitamin D3 and Omega 3. Do you need both? 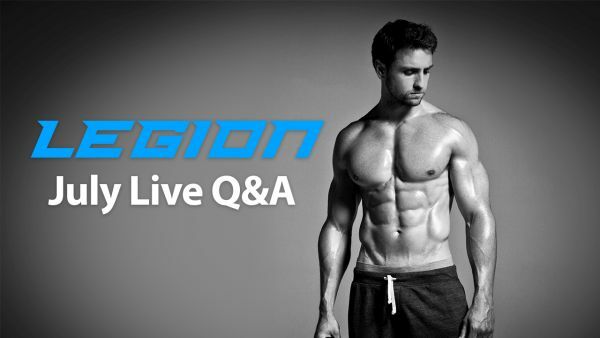 57:06 – Why is the Legion Whey+ only 70% protein? 58:13 – I have heard that multivitamins do not dissolve well into the body. Is this true? 59:09 – Does Bigger Leaner Stronger work for Athletes? I am a Rower so its a mix of sprints and endurance. 1:01:05 – What do you think of the current season of True Detective? 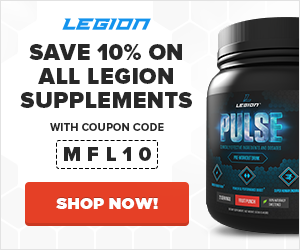 1:02:15 – What is a good replacement multivitamin while Legion Triumph is out of stock? 1:03:27 – What do you recommend for people who get lower back pain/stiffness when doing traditional deadlifts? Would you recommend switching over to sumo deadlifts instead. Tom Brady’s Diet Is Healthy But Ridiculous. Should You Follow It?